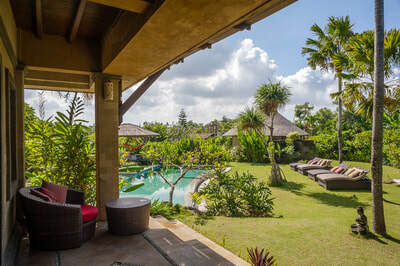 Seminyak – 10 mins; Berawa & Batu Belig beaches – 2 min walk. Booking Rental below are 1 Night Stay Charges for upto 14 adults, they exclude service charges & applicable taxes besides a Damage Security Deposit. In Indonesian, Bunga Desa means the prettiest flower of the village and this charming villa will surely captivate you with its stunning sunset vistas, sparkling pool and spacious tropical garden. 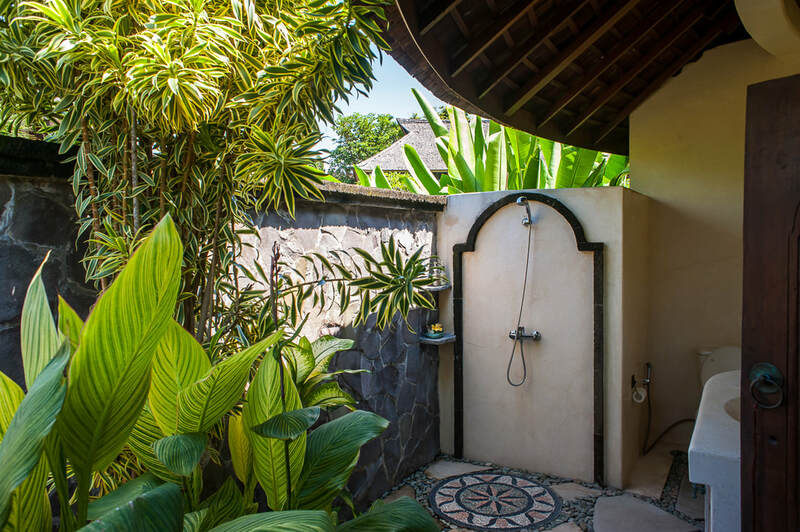 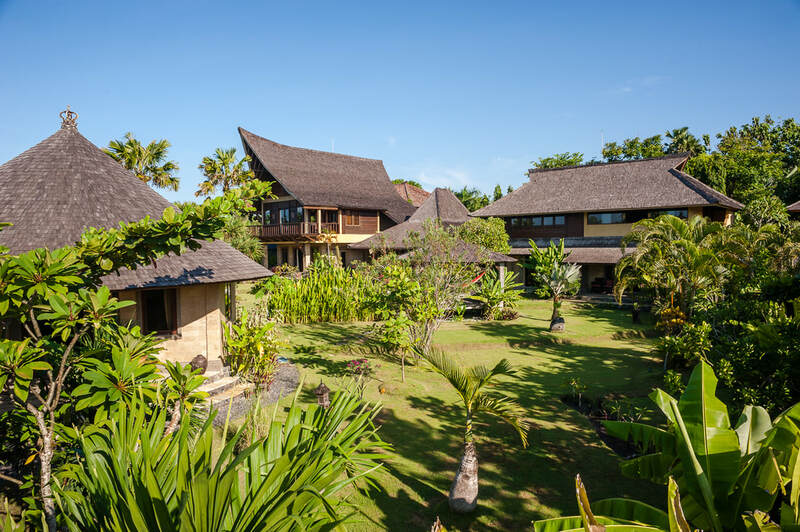 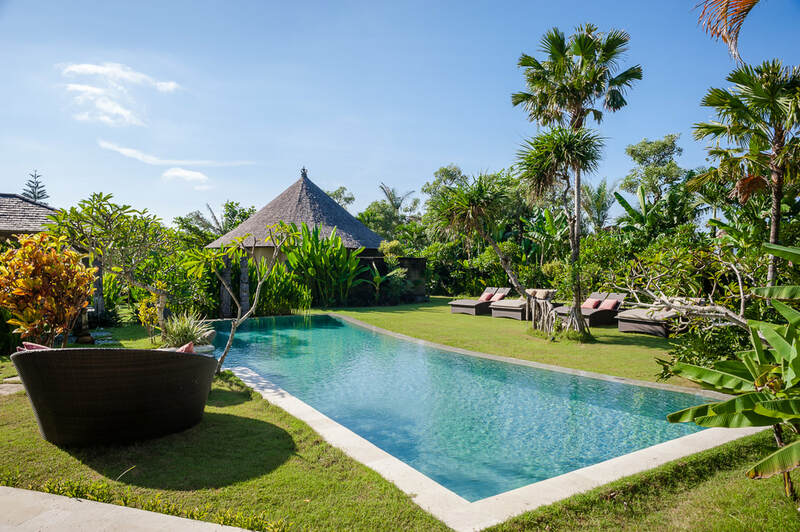 This peaceful sanctuary, nestled between Batu Belig and the southern shores of Canggu, is within walking distance of Berawa and Batu Belig beaches and just a 10 minute drive away from fashionable Seminyak. 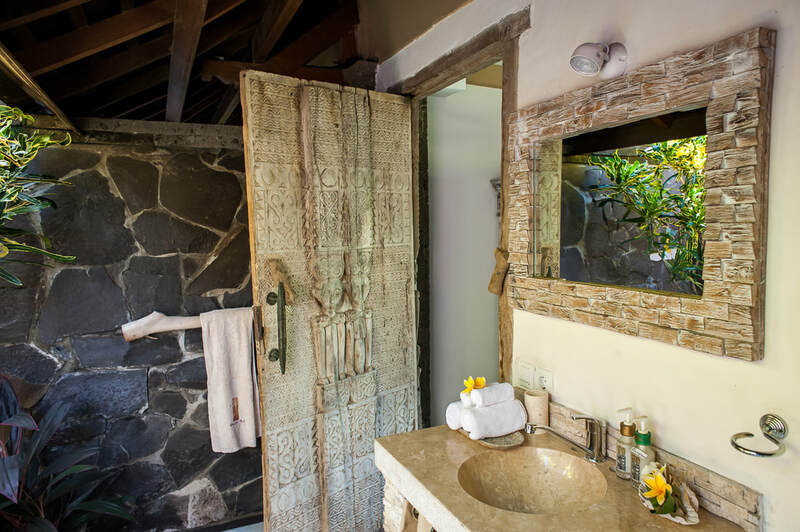 The decor is a blend of tropical Indonesia with a mix of tribal architecture and antiques. 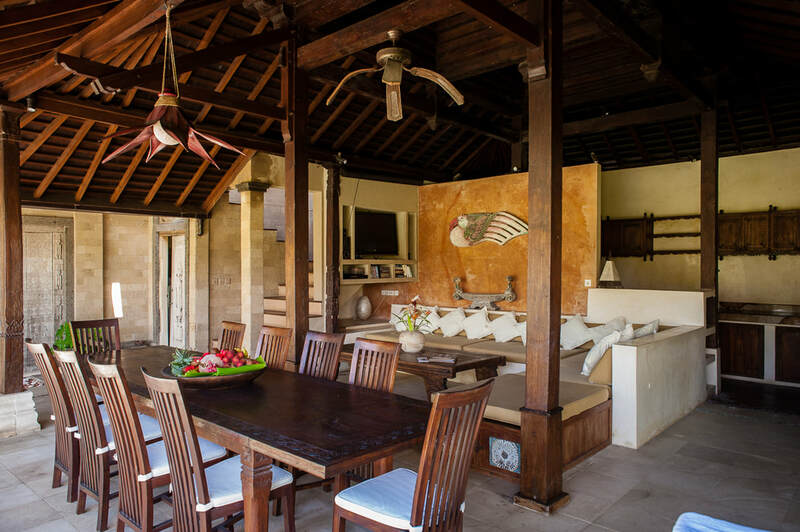 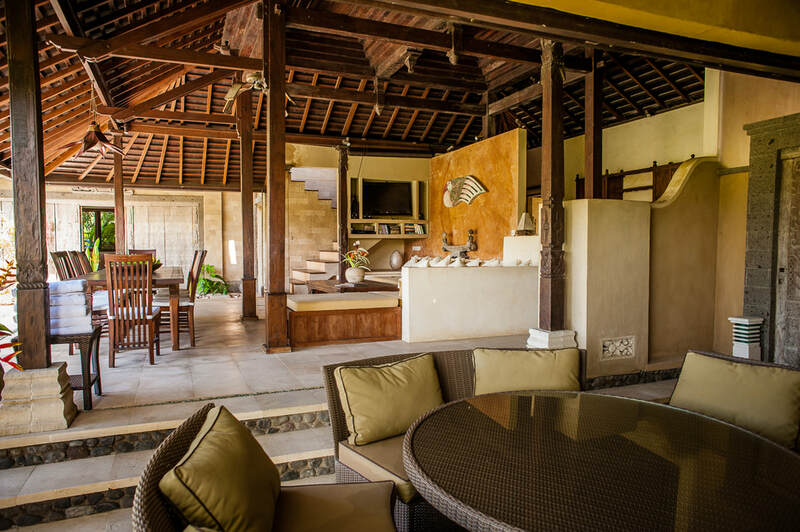 The 7 bedrooms of Villa Bunga Desa can accommodate up to 14 guests and is the perfect getaway for families holidaying together as well as for groups of friends. 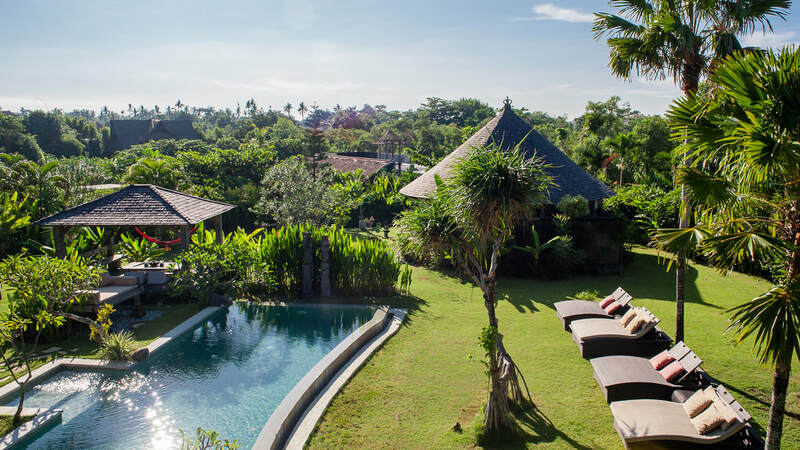 The gorgeous 1700m² garden features palm trees, pink and yellow frangipanis and the spacious lawn is filled with decorative antique pieces from all around the Indonesian archipelago. 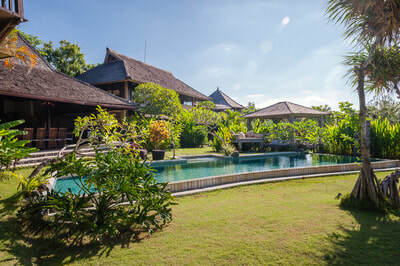 Relax on one of the sun loungers in front of the 12 meter pool and enjoy the cooling sea breezes of the nearby ocean. 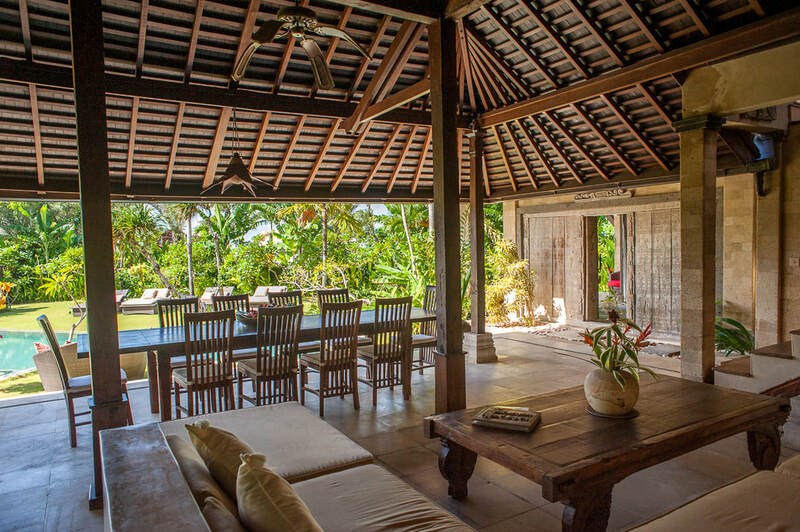 The open air living pavilion is a traditional Javanese joglo with soaring roofs. The dining area is furnished with a table for 14 people and right next to it is a sheltered open-air terrace furnished with a circular table for eight, perfect for alfresco dining and barbecues. 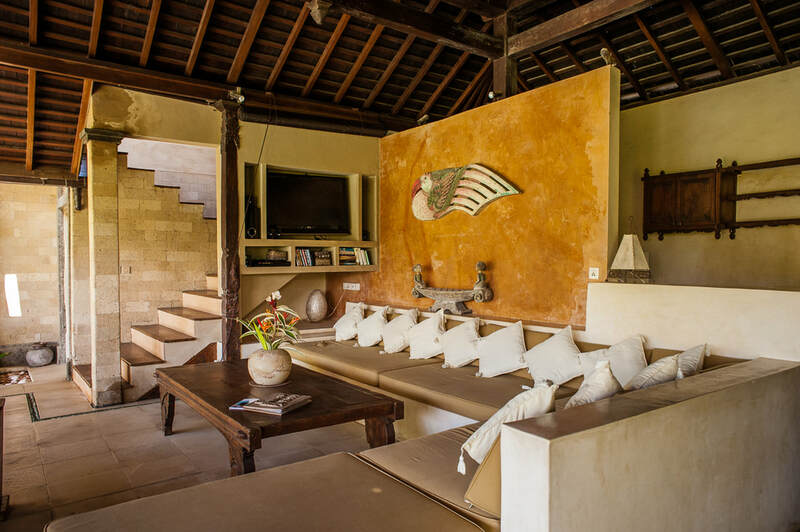 A generous built-in, L-shaped, cushioned sofa is oriented around a coffee table. The large kitchen, equipped with an oven, four-burner hob and microwave, is housed in the same building for those who wish to cook for themselves. 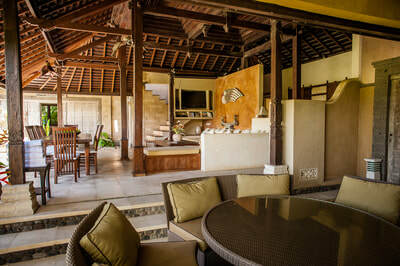 Or you can try out one of the delicious home cooked meals by the excellent cook. 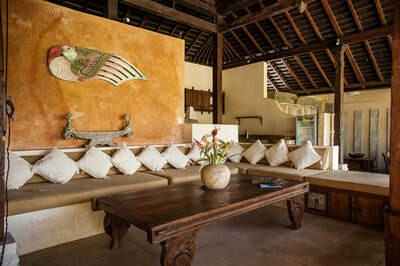 Long-standing staff will welcome you like family, extending the heartfelt hospitality that the Balinese are famous for. 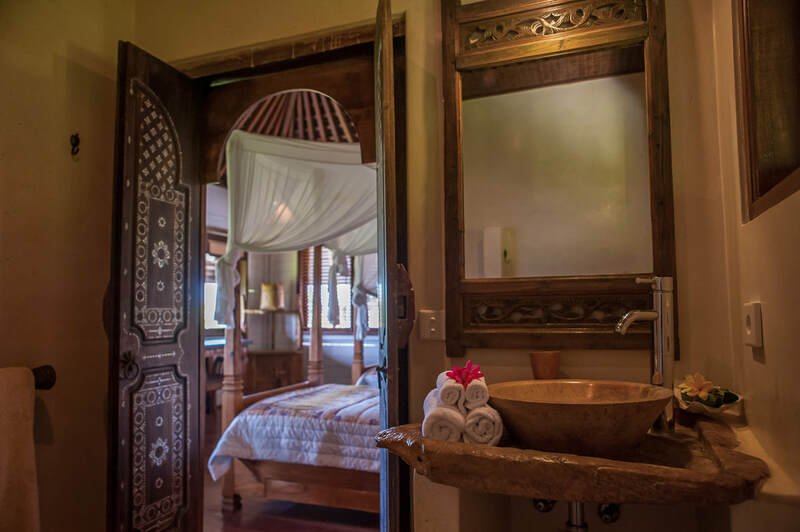 Should guests have any special requests, staff will go the extra mile to make these wishes come true. 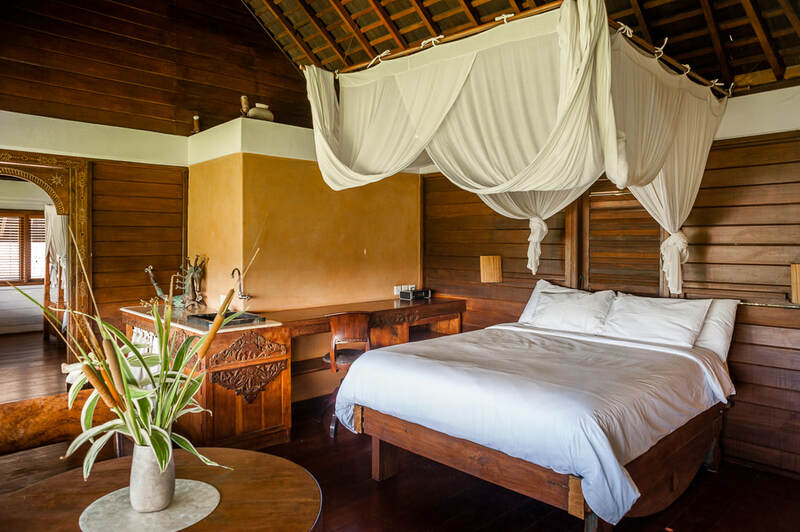 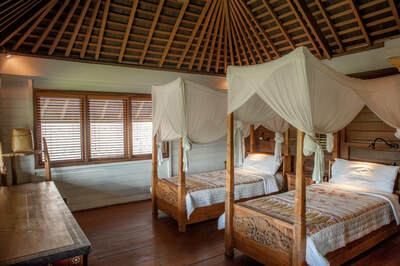 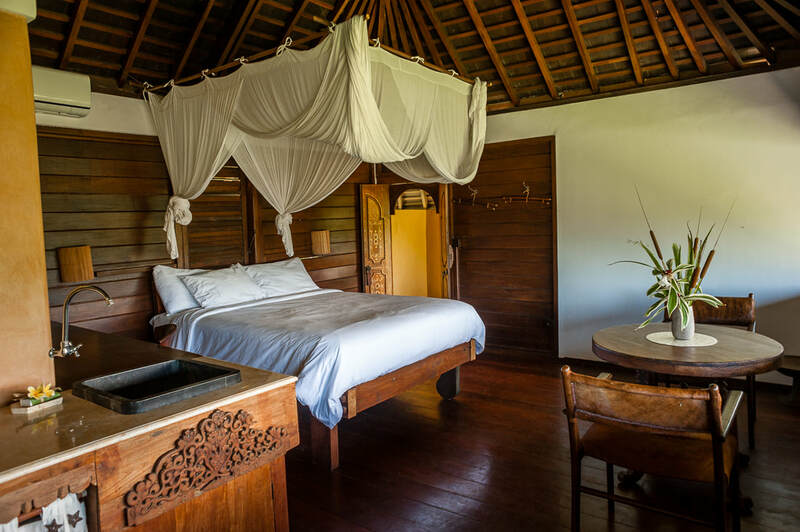 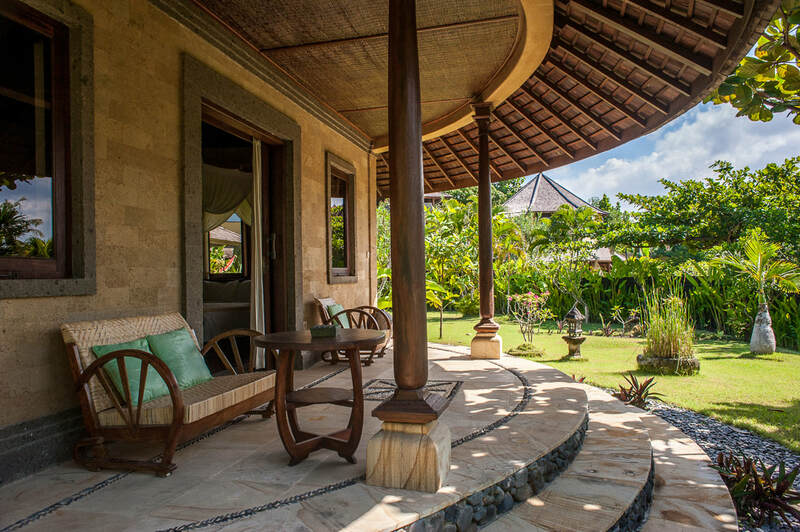 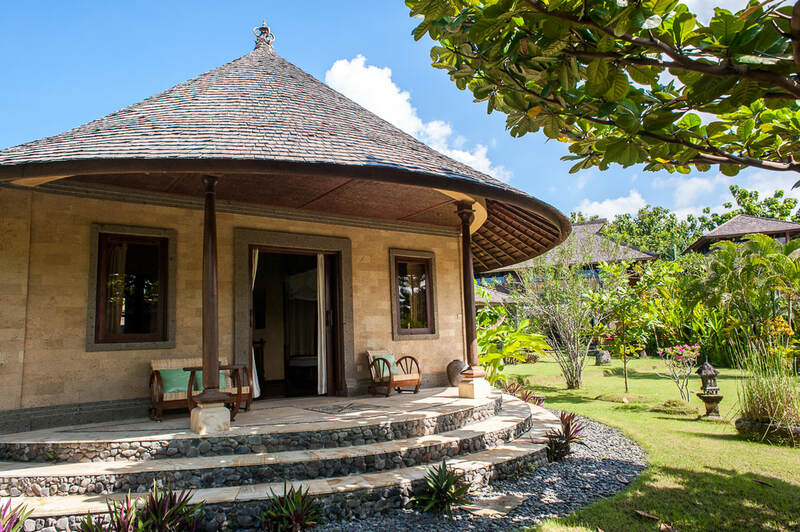 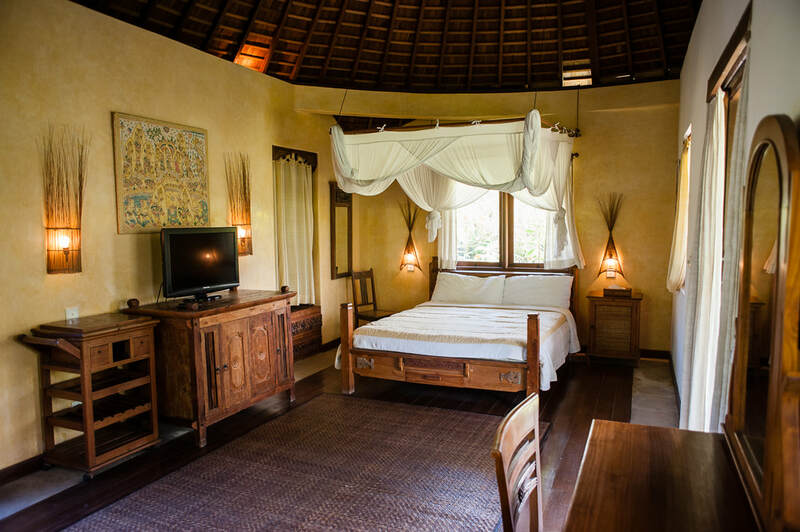 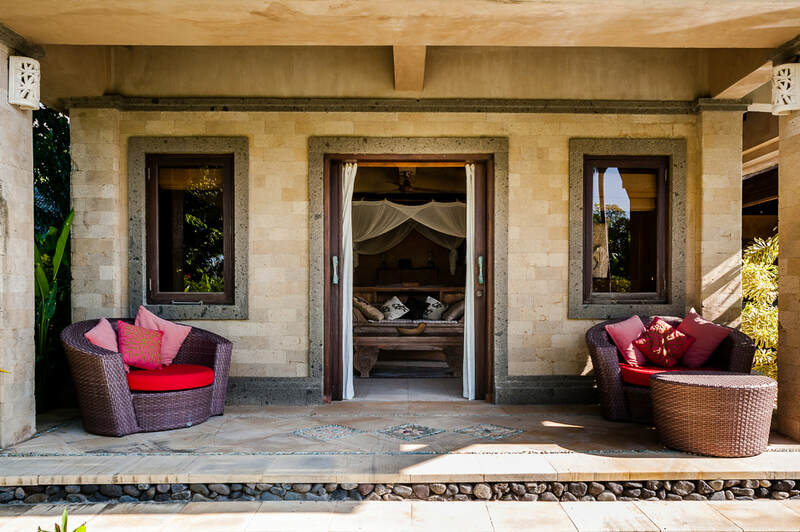 The 7 bedrooms of Villa Bunga Desa are housed in three stand-alone pavilions. 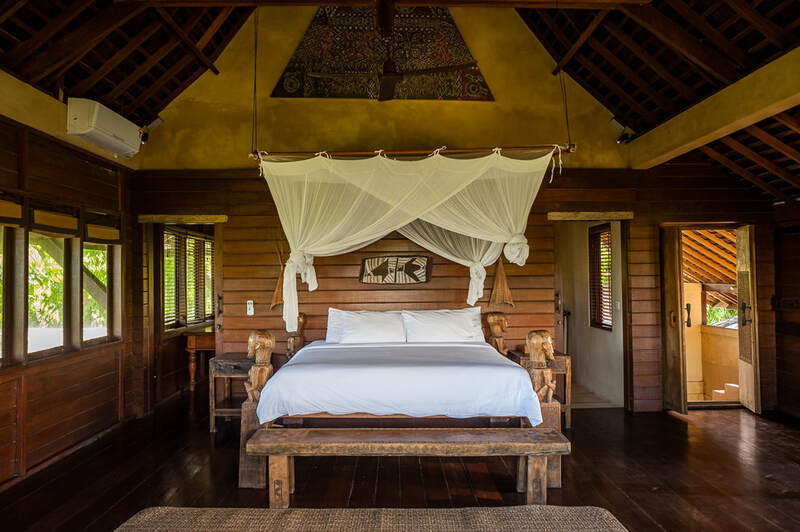 The two-storey pavilion, inspired by the Toraja houses of South Sulawesi, has a downstairs bedroom furnished with a king-size bed and its own a private terrace and ensuite outdoor bathroom with shower and bathtub. 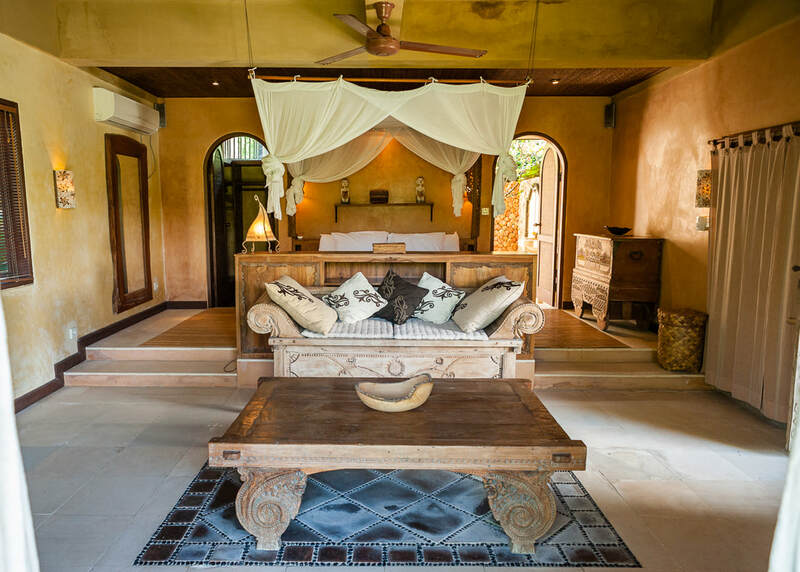 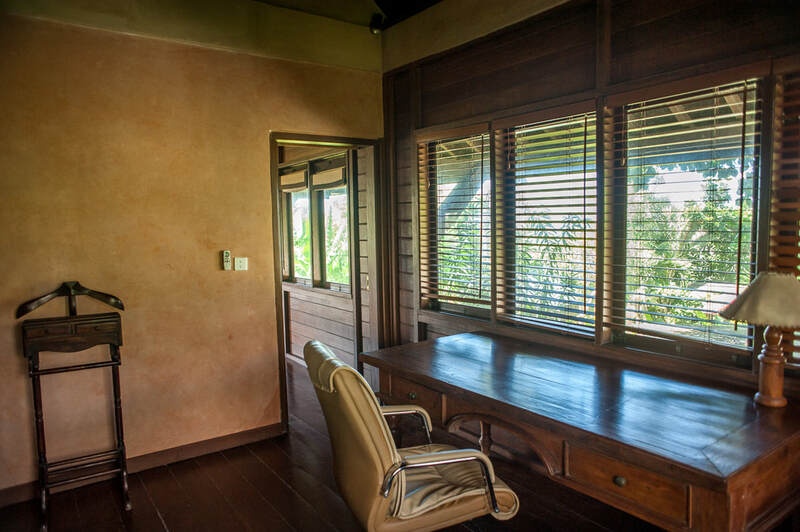 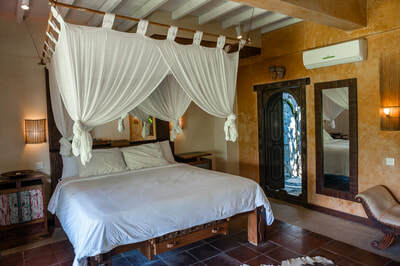 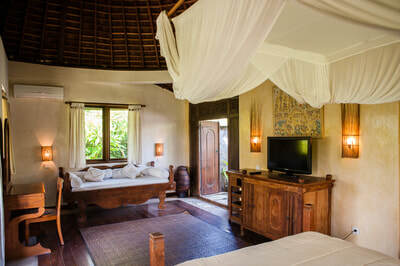 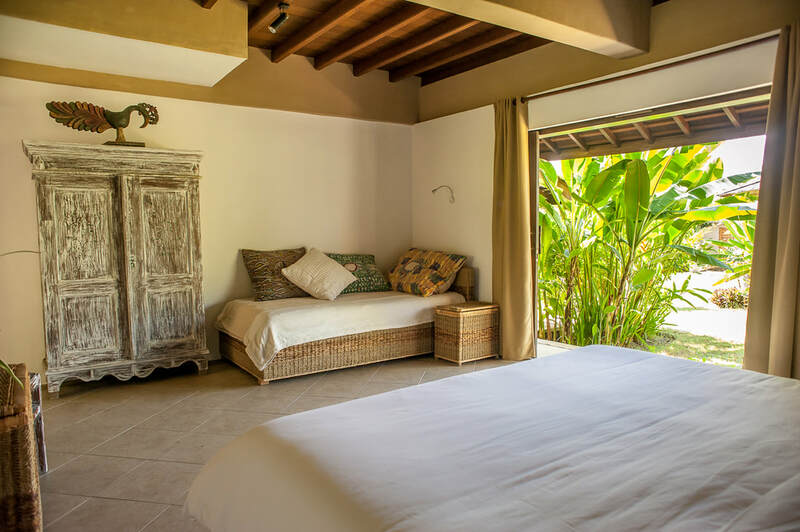 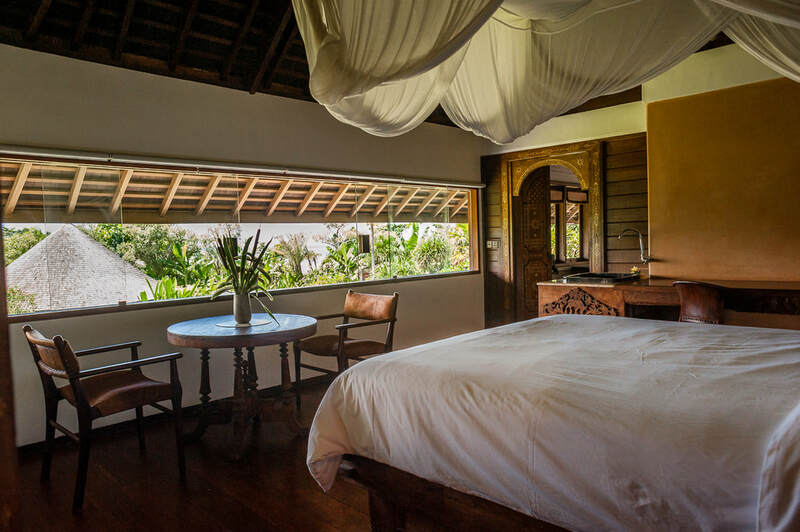 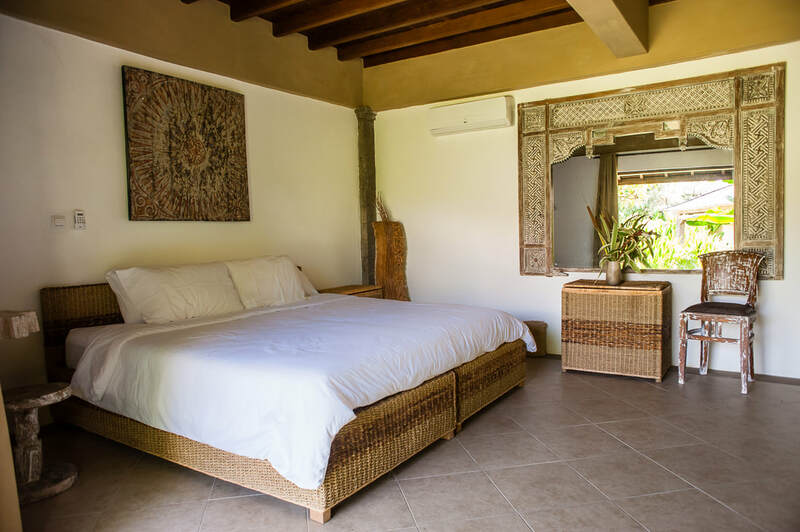 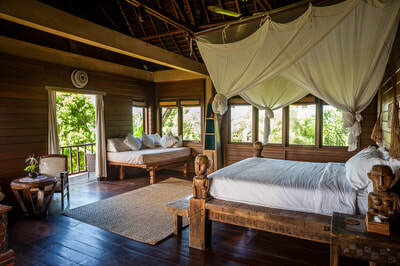 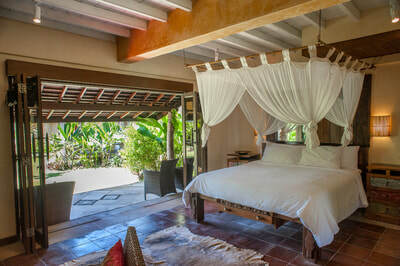 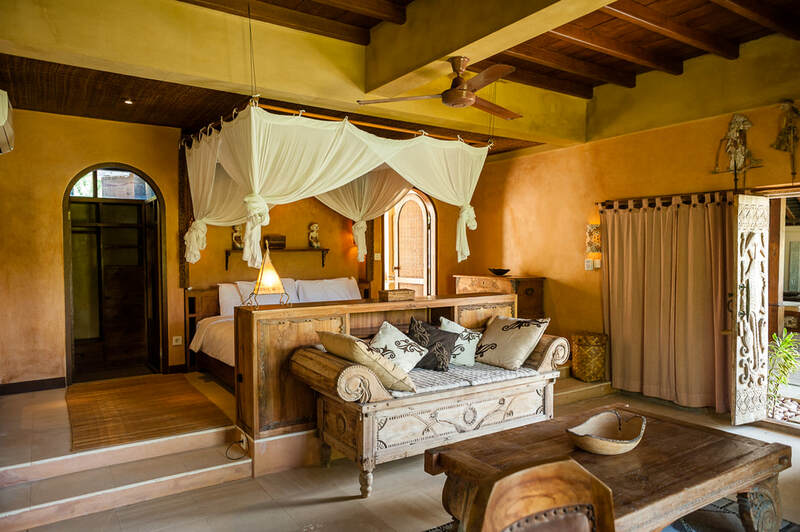 The ensuite master bedroom on the second level is furnished with a spectacular carved king sized bed from Timor and has an open terrace to relax and admire the ocean views. Connecting to the master room is a small study that can be converted with a single bed. 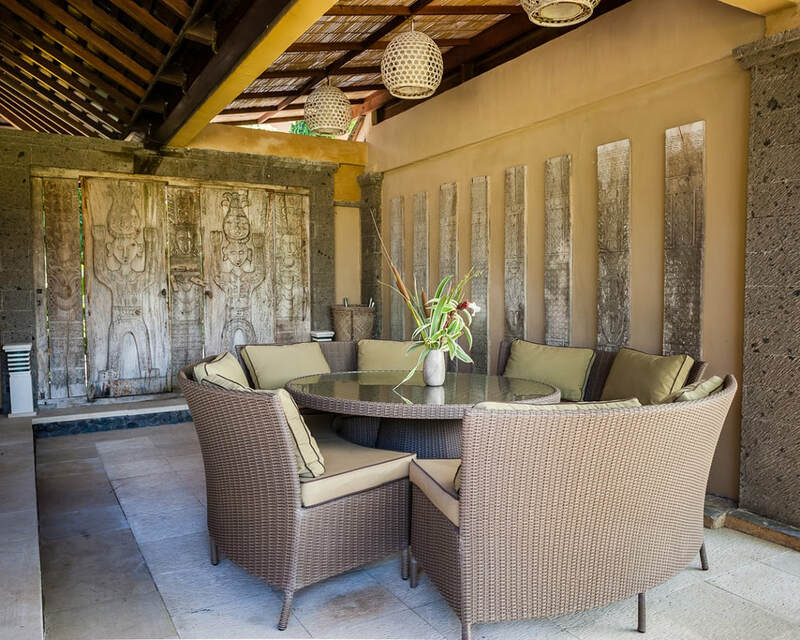 Set in the middle of the garden, the one bedroom round house offers complete privacy with its own covered terrace with chairs and a table to relax enjoy the garden views. 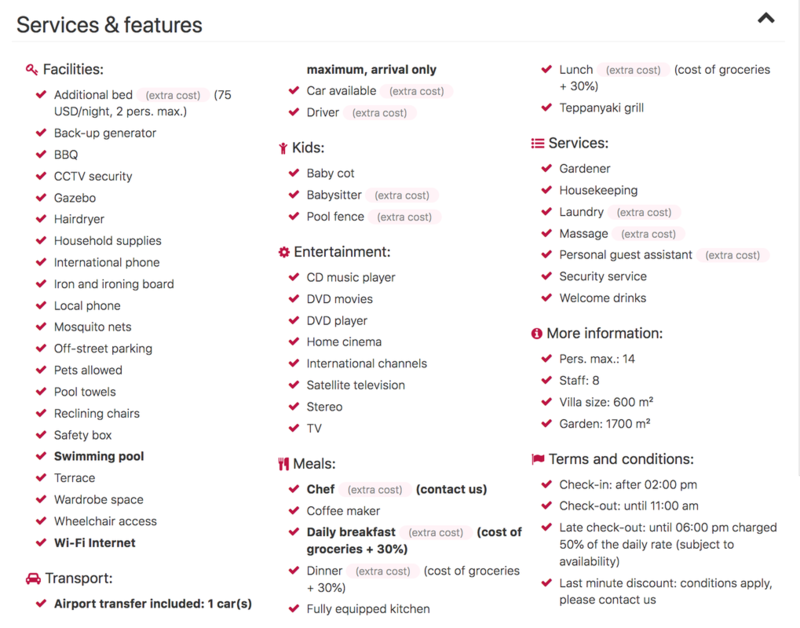 The room is furnished with four poster queen-sized bed, large day bed and an ensuite open-air bathroom. Next to the living room, is the third and largest two floor pavilion. The first level provides 2 bedrooms with their own private ensuite open-air bathroom with a small garden. 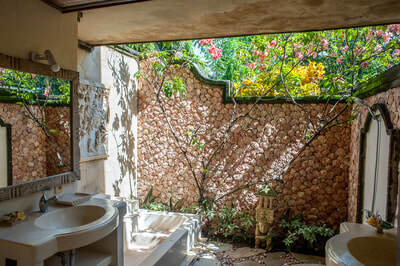 One bedroom boasts a king-size bed and a private terrace overlooking the pool and lush gardens. 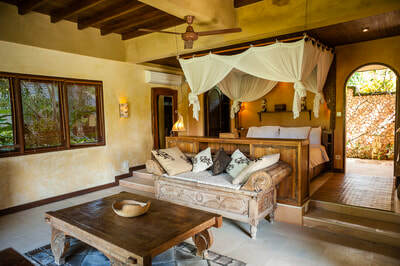 The room next door is furnished with a king size bed and a single bed. The second floor of consists of a family suite with an open living area with a double bed and next to it is a connecting room with twin-beds (designed to convert to a king). 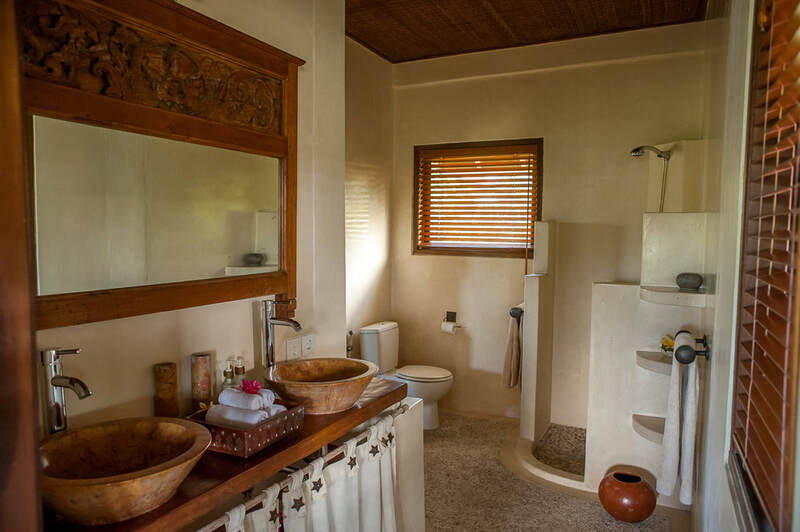 The bathroom here is accessed via the twin bedroom making this suite ideal for families. 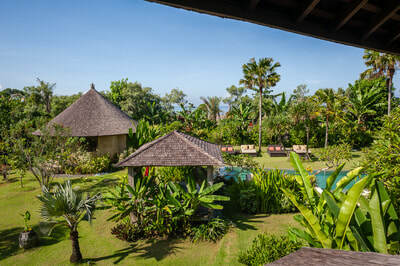 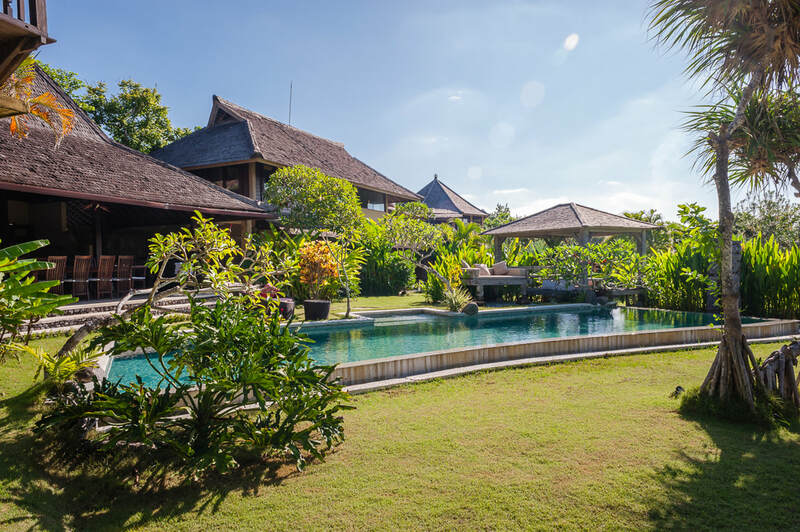 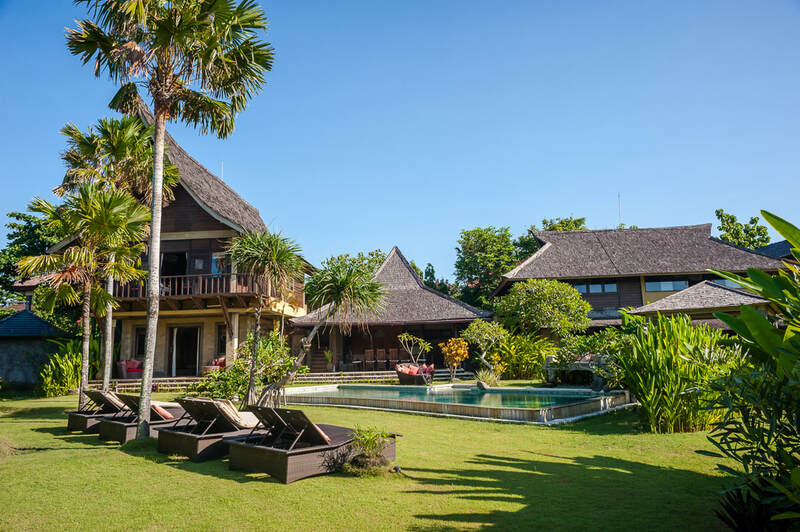 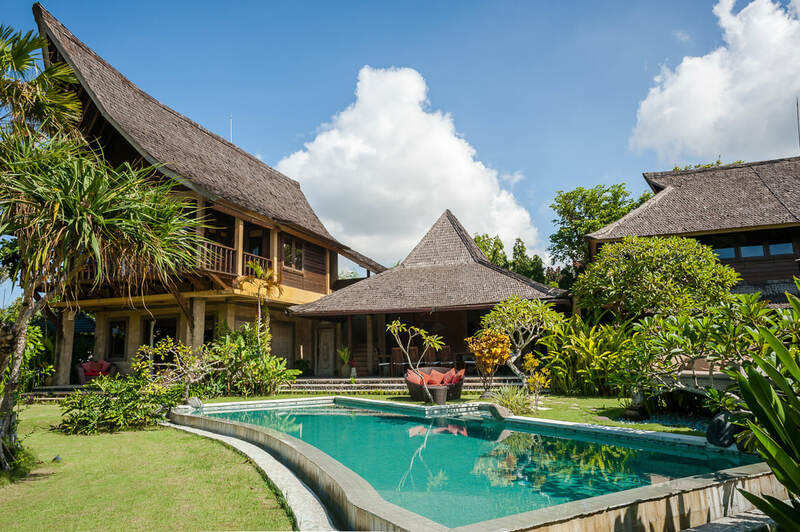 If required, Villa Little Bunga Desa can be rented at the same time to provide guests with a eleven bedroom renting option, making it suitable for hosting weddings and events.